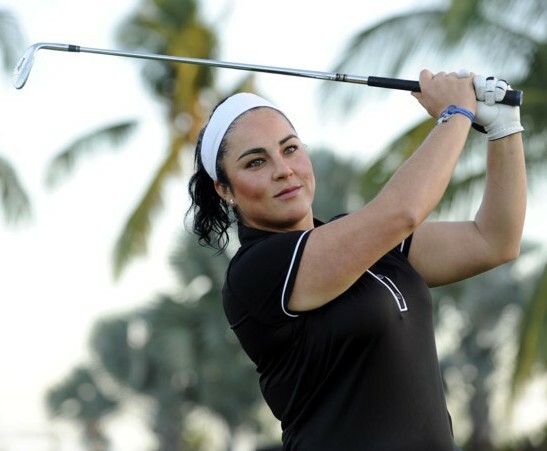 We're featuring Lili Alvarez on Day 5 of our series on the cast members of Big Break Sandals Resorts, which premieres on the Golf Channel in June. Lili garnered some media attention at the beginning of the 2010 Duramed Futures Tour season because of her caddie. LPGA commissioner Michael Whan looped for Lili in the first round of the Florida's Natural Charity Classic. Lili was born in El Paso but grew up in Mexico, and played junior and amateur golf with, among others, Lorena Ochoa. She won three tournaments during her collegiate career at Tulane University, and was the Conference USA Player of the Year in 2003. She also won the Mexican Amateur Championship in 2004. In 2007 she graduated college with a degree in political science, and turned pro on the golf course. Lili has played the Futures Tour since 2008, with a best finish so far of 13th. At the time this post was written, she had made the cut in four of the five tournaments she'd played so far in the 2010 season. The only one she didn't make? The first one, with Commissioner Whan on the bag. Bad caddie! Lili Alvarez (26, El Paso, Texas) – One of Mexico's elite amateur golfers who grew up competing alongside Lorena Ochoa, Alvarez's fun loving personality is infectious on the Duramed FUTURES Tour. A student at Tulane University in New Orleans who endured the devastation of Hurricane Katrina, Alvarez learned to appreciate life to the fullest.